Germplasm distribution is the supply of representative samples of seed accessions from genebank in response to requests from germplasm users. Genebank distribute seeds only from active collections. The purpose of conserving germplasm in genebank is either to improve crop varieties through plant breeding activities or to restore diversity lost on farms in order to meet the needs of farmers and communities. This contributes directly to improving the livelihoods of poor people and to protect the environment. In the past, not enough emphasis was given to germplasm distribution. In genebank it is now widely recognized that the utilization of germplasm should drive its conservation. 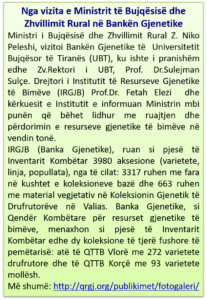 Therefore Albanian genebank is being more proactive in establishing links with germplasm users, breeders, researchers, farmers and other groups. 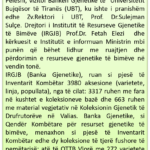 Albanian genebank has distributed plant germplasm within and outside of the country as follow: 20 accessions have been given to the Faculty of Natural Science, 88 accessions to the Agriculture University of Tirana, 19 accessions to the Institute of Field and Vegetable Crops (Novi Sad, Serbia), and 19 accessions to the National Genebank of Ukraine. These include 12 accessions of peas, 10 of beans, 40 accessions of oregano, and 21 of alfalfa. Genebank during the last two years has also delivered to farmers 9 local varieties very adapted to the specific environment. These include 3 farmers’ varieties of tomato, 2 farmers’ varieties of pepper, 1 of wheat, eggplant, alfalfa and oat.